The Gift of Truth, Inc.: Daughters of Destiny Spiritual Mentorship Academy--NOW ENROLLING!!! 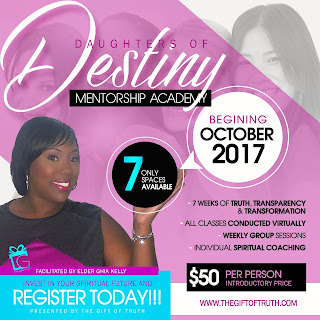 Daughters of Destiny Spiritual Mentorship Academy--NOW ENROLLING!!! I am super excited to tell you about this wonderful opportunity!!! 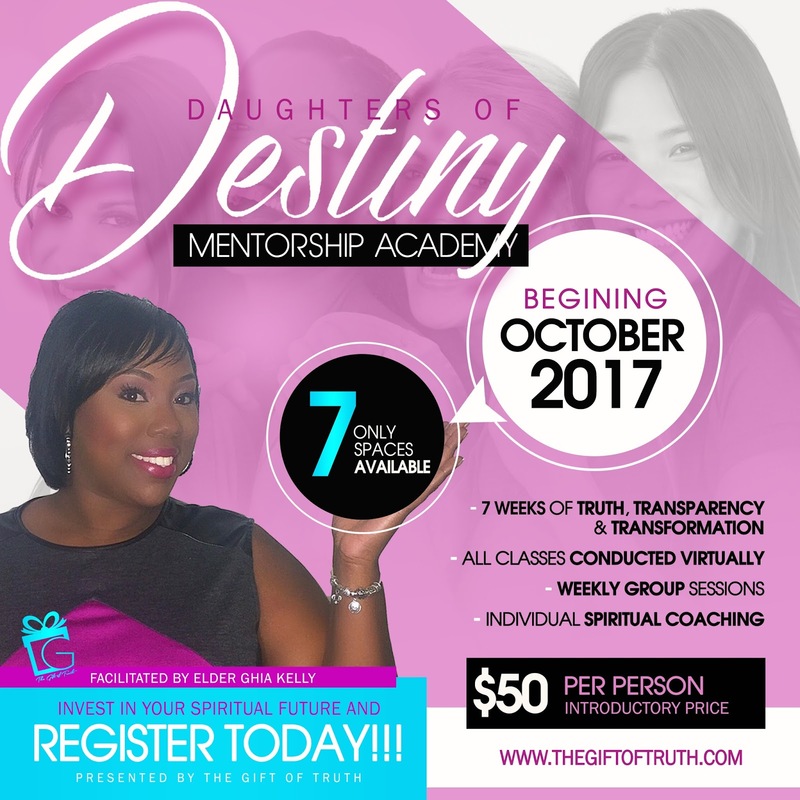 The Daughters of Destiny Spiritual Mentorship Academy is a 7 week program for women who feel stuck or stagnant spiritually and need a push! This program will be facilitated by Elder Ghia Kelly, Founder of The Gift of Truth Inc., a woman committed to empowering other women and helping them walk bodly in their God-given purpose. This 7 week academy will focus on truth, transparency, and transformation and will include weekly group sessions, individual spiritual coaching, and spiritual reflection activities and exercises. There are only 7 spaces available and this first cohort will be offered at an introductory cost of $50 USD. The academy will start October 2nd and conclude the week of November 13th. All sessions will be conducted virtually so women can participate from any location as long as they have a smart phone or tablet and internet access.